WATER VALLEY- Ms. Lasheller "Peaches" Horton, 34, passed away on Sunday, March 4, 2018 at Baptist Memorial Hospital in Oxford. She was born on February 20, 1984 to Earl Horton and Shirley Horton. Services will be held on Friday, March 9, 2018 at 1p.m. at House of Prayer Church of God in Christ in Water Valley. Burial will take place at Oak Ridge Cemetery in Water Valley. Serenity-Daniels Funeral Home of Water Valley is in charge of the arrangements. She leaves to cherish her loving memories her mother: Shirley Horton of Water Valley. One brother: Albert Horton of Water Valley. A very close friend: Wall Street. 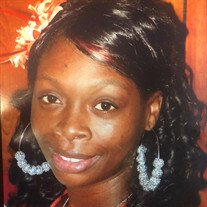 She also leaves two step-children: Shania Gipson of Charleston, MS and Shabonna Carr of Batesville, MS. A host of cousins and friends. Visitation will be on Thursday, March 8, 2018 from 4-6p.m. at Serenity-Daniels Funeral Home Chapel in Water Valley.